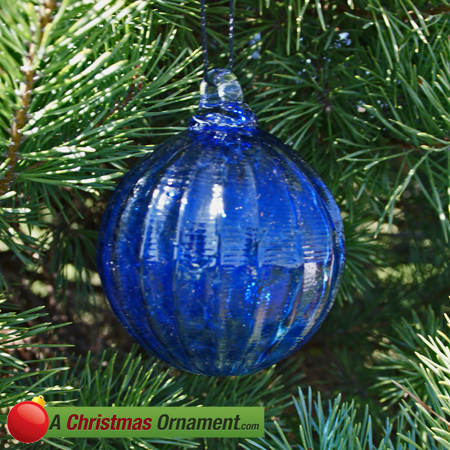 Christmas Ornaments Made in USA - Cobalt Blue Crystal Glass Optic Three Inch Ornament Ball - A Christmas Ornament Co.
Another piece from our line of glass ornaments is this beautiful, work-of-art Christmas ornament. This 'optic ornament' was hand-blown into a very old Victorian-style antique mold acquired by craftsmen from a long defunct glass-blowing operation in Ohio. Since each one is hand-made (although with a mold, not "free-blown") no two are identical. It can stay outdoors all year long - anywhere. If it falls to the earth most likely it will not break. This Christmas ornament is made by a glass blowing company that have been in the business for 80 years. Lead-free so safer for the children. This cobalt-blue glass is a beautiful piece. Ornament is 3 inches wide and is made by artisans with pride in the USA. All ornaments are insured and delivered to your home by the United States Postal Service. USPS is committed to doing "absolutely, positively" whatever it takes to deliver the ornaments to you.